Has Female Equality Progressed in Hollywood in 2014? A year on from when we last looked at gender inequality in Hollywood, recent events have forced the issue of disparity in pay between female and male actors into view. As the Sony hack revealed, Jennifer Lawrence—the second highest paid actress of 2014—alongside her co-star Amy Adams, both received lower amounts of the back-end of American Hustle than their male counter-parts. While there is a lack of comprehensive data to support Swank’s exact claims, it is clear that there is a very real gap in the amount paid to male and female actors. Last year, we looked at Forbes’ list of the top ten paid actors and actresses and found that the highest paid actress of that year, Angelina Jolie, made roughly the same amount as the bottom two actors in the top ten, Denzel Washington and Liam Neeson. More so, we found that on a whole, the top ten highest paid actresses made a combined $182 million compared to the $464 million made by the top ten men, over twice the amount. Given this issue coming up in the mainstream press lately, we decided to update our findings for 2014 and see what, if any, progress has been made. While we only have access to the ten highest paid actors and actresses—which reflect a far more inflated pay rate than the rest of those in Hollywood earn—it does appear that we might be starting to move in the right direction. 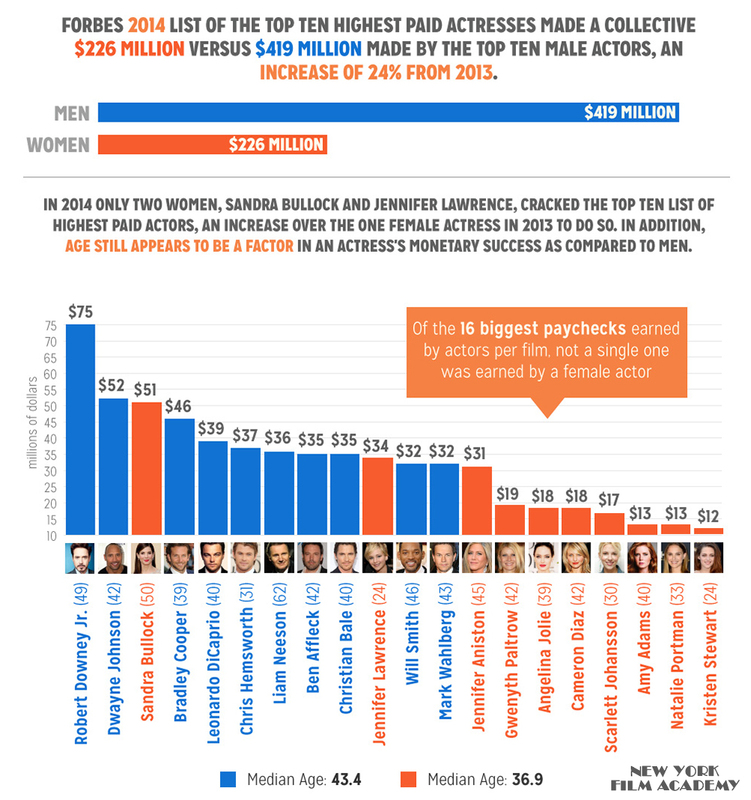 As can be seen in the two above graphs comparing the earnings of actors and actresses in 2013 and 2014, there has been substantial growth in the pay actresses received in 2014. This year, Sandra Bullock, ranked third overall for both men and women on the success of Gravity—bringing in $51 million, nearly 20 more than any actress had made the year prior. Overall, the pay appeared to go up for the top actresses compared to 2013’s list, with the top ten highest paid actresses making $226 million in 2014, up 24% percent. Meanwhile, the men’s collective pay was $419 million, down nearly 11% from 2013. 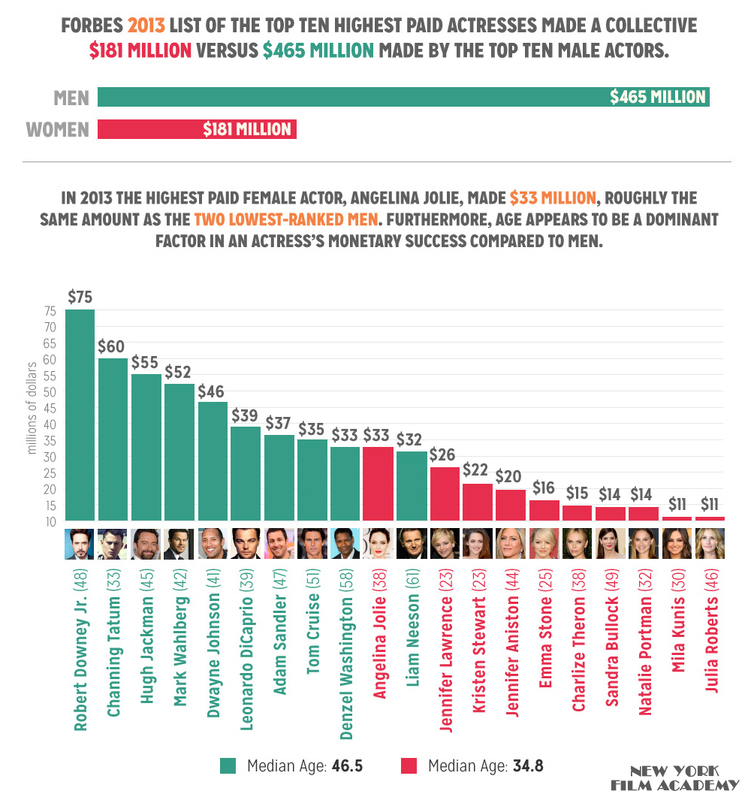 In addition, while in 2013 the highest paid actresses’ ages tended to skew far younger than the men, 2014 also saw the median age increasing to 36.9 from 34.8 in the year prior. However, it’s still clear that acting is a younger woman’s game and Hollywood continues to hold out on big paychecks for older actresses. Of course, as these numbers tend to fluctuate on a year-to-year basis, it’s still premature to say that Hollywood is moving closer to gender equality, especially considering the prevalent lack of women behind the camera and in positions of power within the studio system. Nonetheless, as awareness of gender inequality continues to be discussed more heatedly, it would seem that Hollywood might be starting to move forward in closing the gender gap. Here’s hoping 2015 sees more progress.